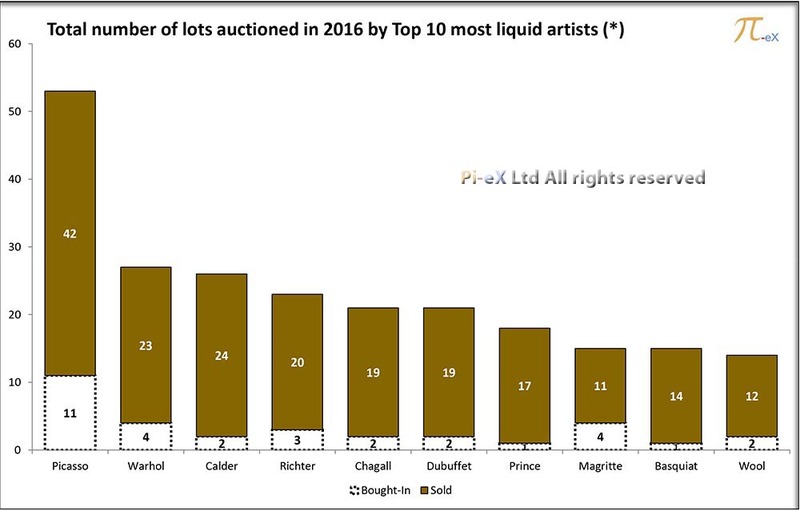 The top 10 most liquid artists for the year 2016 sold together a total of 201 artworks or 21.5% of all lots sold at Christie's, Sotheby's and Phillips in 2016 by 321 artists at all fine art evening sales in London and New York. 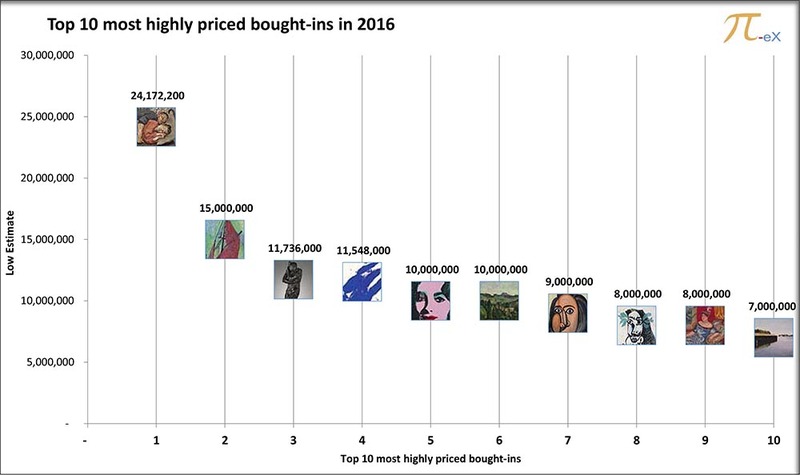 The top 10 most expensive artworks sold in 2016 generated together $462,268,050 of Hammer Prices. 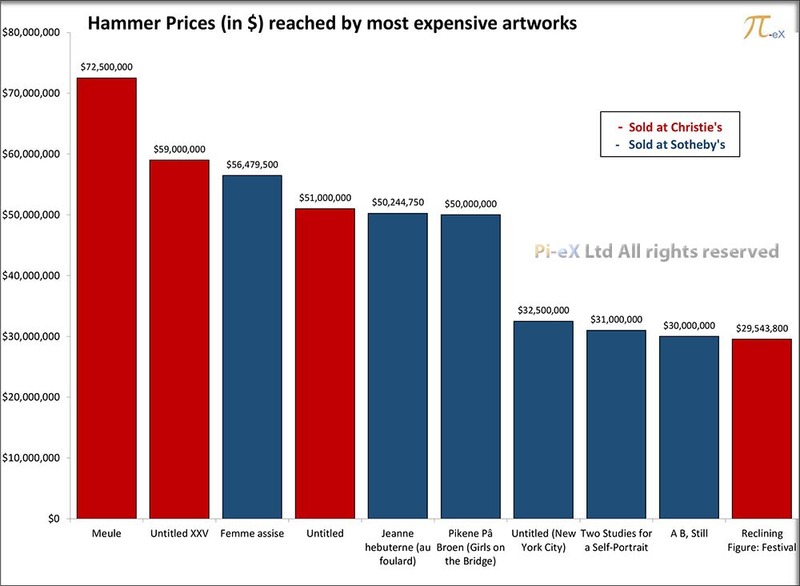 Six of the sales took place at Sotheby's, while four happened at Christie's and none at Phillips. 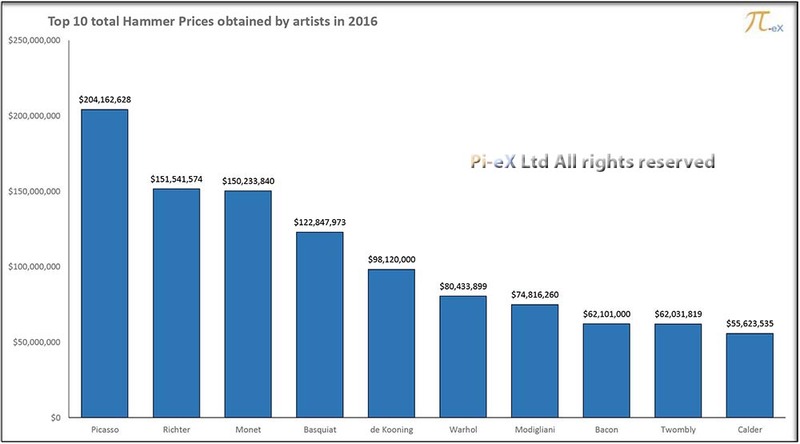 Total Hammer prices for the top 10 most invested in artists reached more than $1 billion in 2016 (*). The majority of works by these artists were sold at contemporary evening sales, only a few at impressionist evening sales. Top hammer prices and volume were the key to their success. 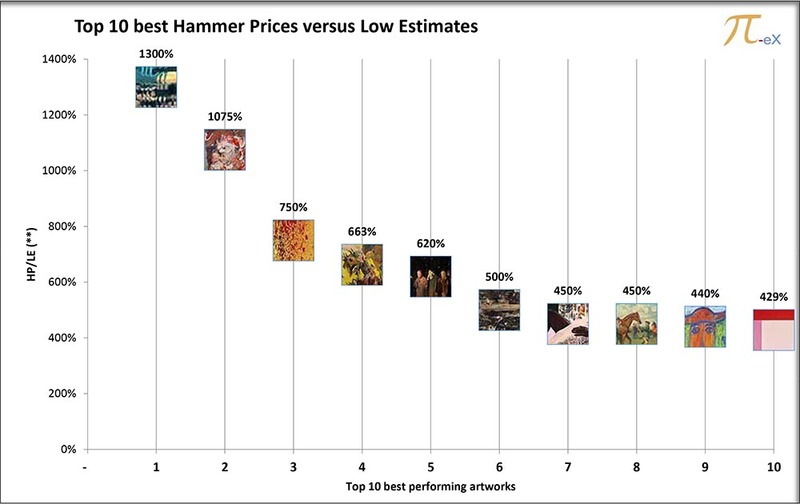 The top 10 best performing artworks are works that achieved Hammer Prices (HP) dramatically higher than their initial Low Estimates (LE), thus indicating a huge interest in the works at the time of the auctions. Interestingly all but one artworks were sold at contemporary evening sales and 3 out of the top 10 artworks were works by artist Adrian Ghenie. In the business of fine art auctions, there is nothing worse for a seller than having a bought-in. 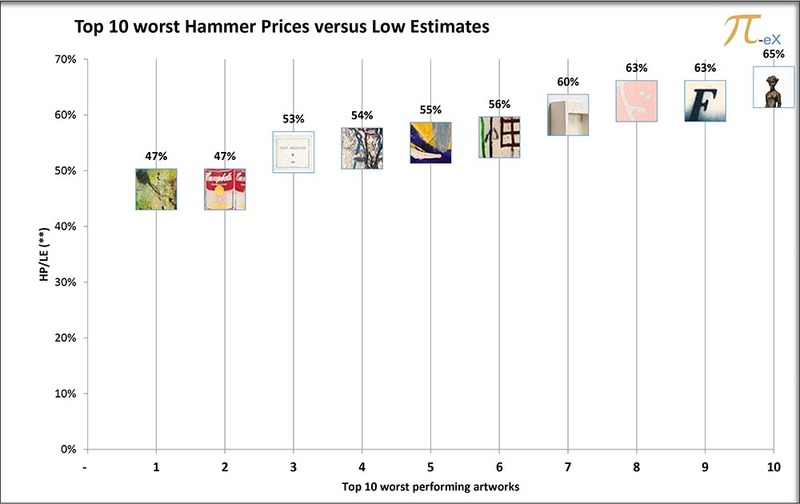 The following top 10 worst performing artworks did not have that terrible fate as they all found buyers. 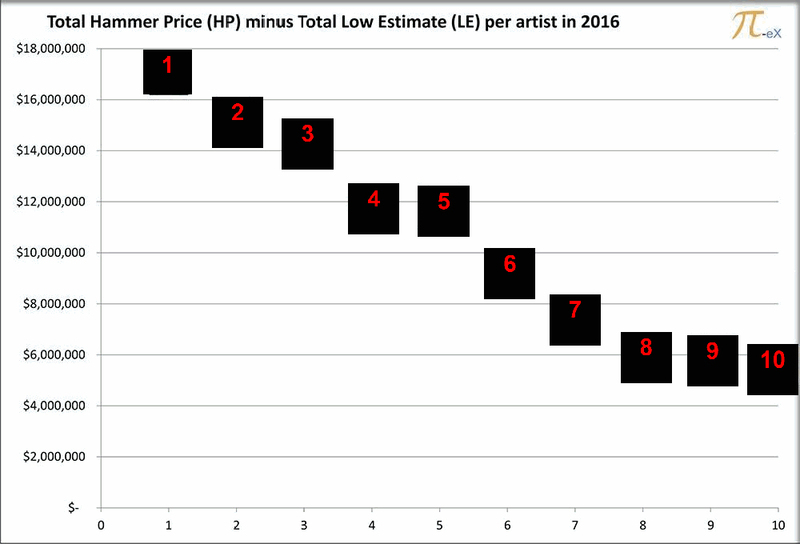 However the Hammer Prices they reached for their sales were much lower than their initial Low Estimates (LE), making their HP/LE ratios some of the lowest of 2016. Given that there are always two parts to a trade, this also means that the buyers of these artworks may have been able to get an amazing discount on their art. There are many ways to rank artists on their performance during the year. In this latest ranking, we chose to look at how much total investment there was at auction in 2016 for a specific artist and how much that compares to what the auction houses were expecting. We thus look at the total value created by the auctionned artworks (Total HP) versus their initial estimates set-up before the auction (Total LE). The bigger the discrepency, the more interest there was at auctions for these top 10 over performing artists during 2016. When auction houses really want to obtain a consignment, they offer the seller of an artwork a guarantee on the consignment. This means that whatever the outcome of the auction, the seller is guaranteed to sell the work. Obviously by doing so, the auction houses take on a huge risk. To hedge against this risk, they often rely on Third parties to commit ahead of the auction to give them an "irrevocable bid" for such guaranteed lots. 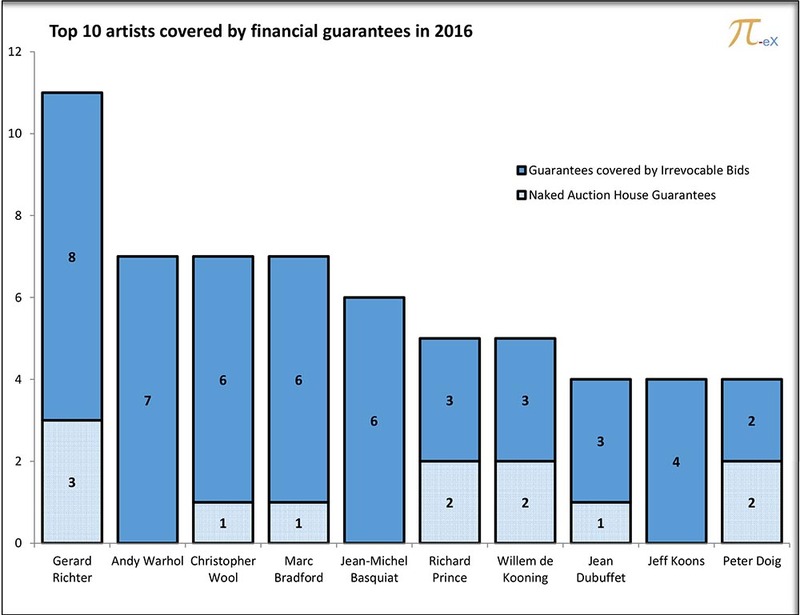 The following artists are the top 10 artists whose works received the largest number of guarantees over 2016. The worst thing that can happen to an artwork when it is auctioned is to be bought in. This happens when no one makes an offer above the seller's reserve price. The following 10 artworks all encountered this sad fate in 2016 and they were the Top 10 most expensive bought-ins based on their Low estimates ahead of the auction.